Our happily proactive gang of painters in Vienna recently got together for a longer session with the model—eleven hours over four evenings. It was a great opportunity to bash away at a few things I have been trying to improve in my drawing. It has been a long time since I’ve troubled myself overly much with rendering, and I have instead been making crude visual notes about planes more than anything. I decided, therefore, that rendering would be my project. 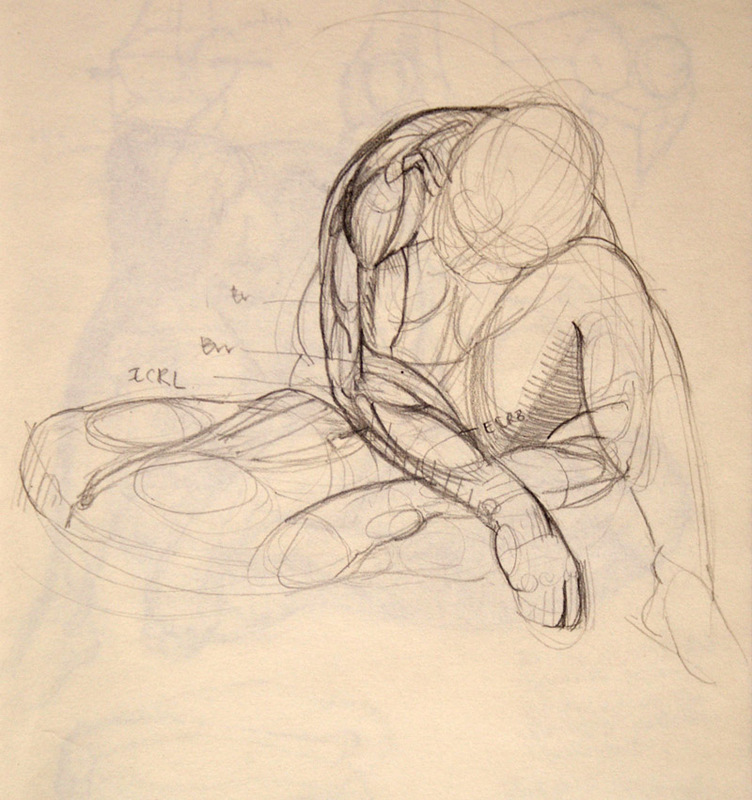 I want controlled lines, delicacy, and pure intent—no lazy, unthinking scribbles. And a little bonus anatomy and memory training never goes astray. We seem to have a never-ending supply of lovely Russian models in Vienna, and Alexandra graced us with a beautiful and complex knot of a pose. From every angle, a gentle sweep ran over the arch of her back and down her raised leg, her head tucked away. 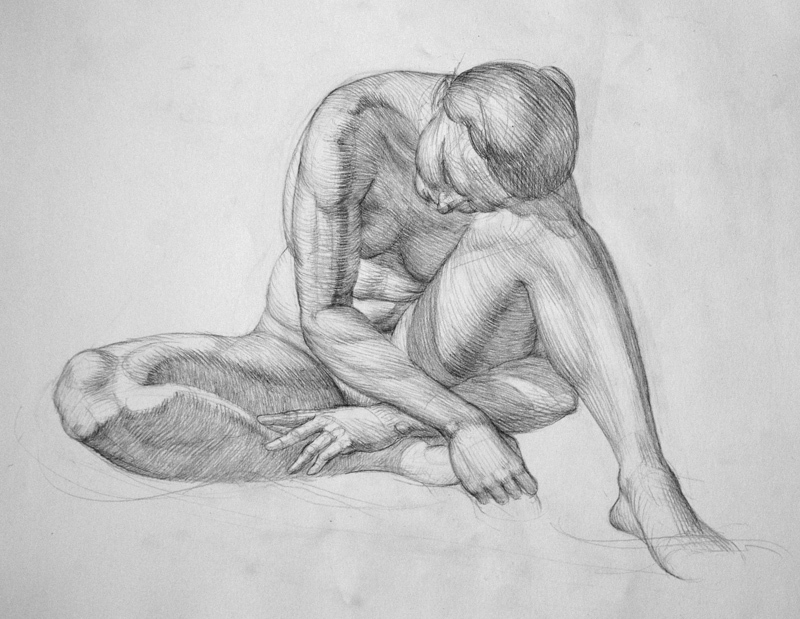 As I began to draw her, I kept this sloping mass in mind, as well as the slope at the bottom of the picture—her foot extending forward. Rather than strictly observing the jutting shapes, I pushed the unity of the drawing, clinging to big C-curves and using their rhythms to drive the composition. I loved the shocking right-angle through her head and left shoulder, but tried to subordinate it to the broader flow over the back. And what became quickly apparent as I drew was the importance of her right arm—it seemed to beg for all the attention. 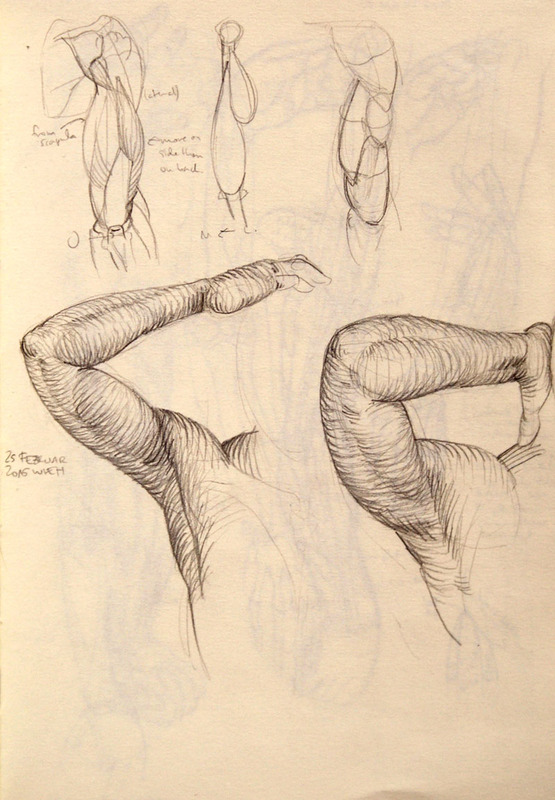 This was very fortuitous, since I had been studying arms, and here was a very clear and prominent arm to investigate, pronated and everything, with the radius pulling the extensor muscles over the forearm. After the first session, I went home and nerded out with Bammes and Goldfinger. Having noted down the bony protrusions and muscles that I thought I could see, observing the colour changes across the skin as the light hugged different forms in its predictable way, I did a bit of fact-checking. It helps to have battled with some real forms in front of you and only then to read all that involved text in your anatomy book, rather than trying to memorise everything first. You are already familiar with so much, and the explanation helps to make sense of the particular situation rather than a general one. My drawing felt quite stiff, though, and I was sorry that I hadn’t really warmed up with some quicker drawings beforehand. Perhaps I should have made a smaller practice one to get the feel for it. But, undeterred, I hoped I could bring some new energy to what I already had the next day. With this in mind, I made a very fast copy in my sketchbook, letting lots of things slide in favour of a looser, livelier drawing. 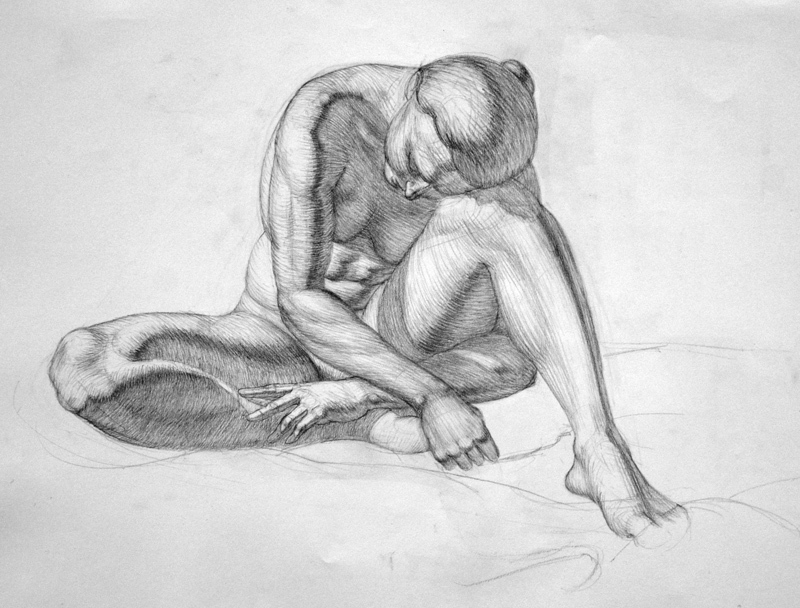 Then I used this little practice drawing to work through what I had learned about arm anatomy as it applied to this pose. 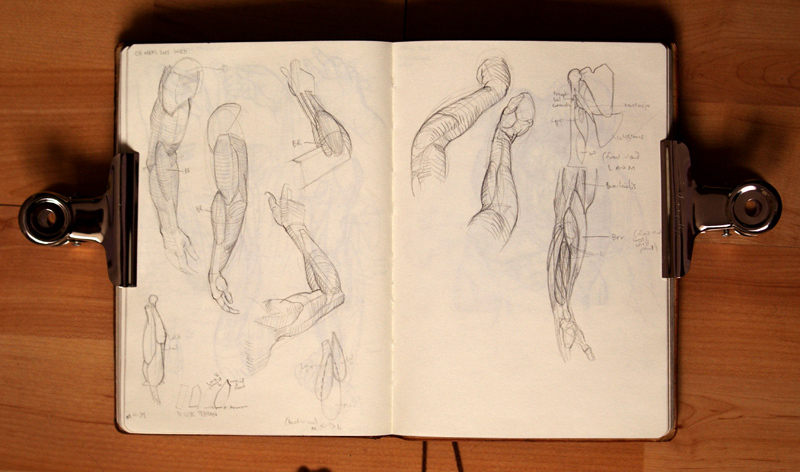 I very forcefully (in a feverish excitement, one presumes) marked in the muscles as I understood them. 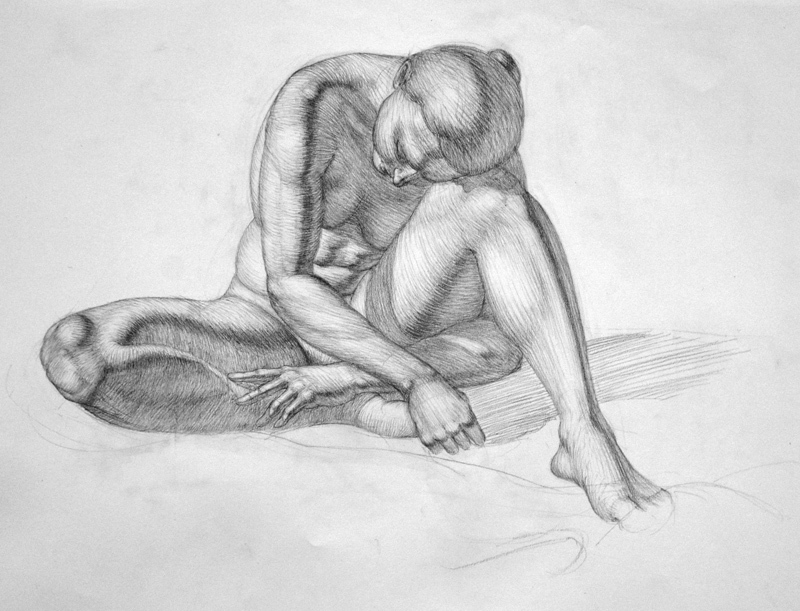 Returning to the model, I adjusted the arms of my larger drawing with the new knowledge fresh in my mind and the real thing before my eyes. This time I was searching for what I knew, and trying to subdue it according to what I could see, rather than just putting down what I could see. Satisfied, I turned to concentrate on something I had neglected for a long time: shadows. 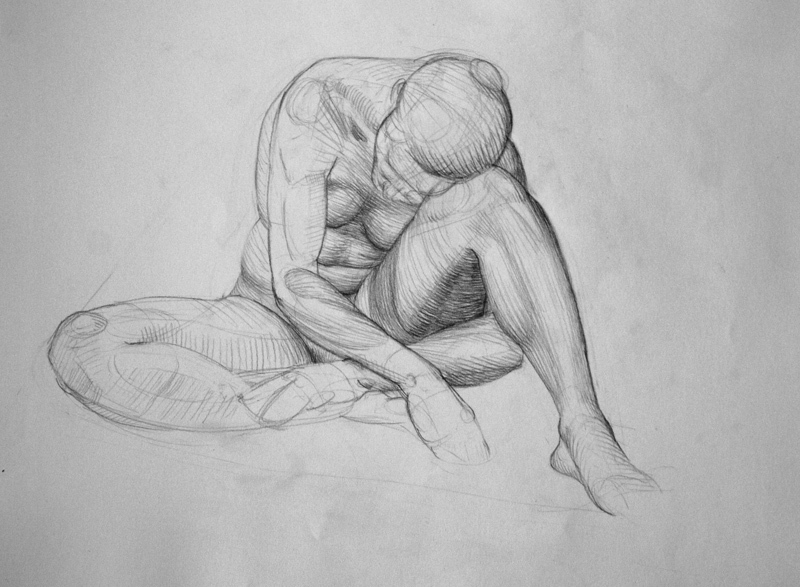 Obsessed as I am with form drawing, I haven’t made tone do much work for me in a long time. I marked in the terminators (the hazy, dark transitions between light and shadow as a body turns away from light—the form shadows) and the cast shadows (the neat-edged shadows that fall across the body because something else is blocking the light), paying attention to the masses and the way that light ought to work. Light obeys rules, because physics, and will always make certain shapes on spheres, cylinders, cones and prisms, which the human figure is more or less composed of. 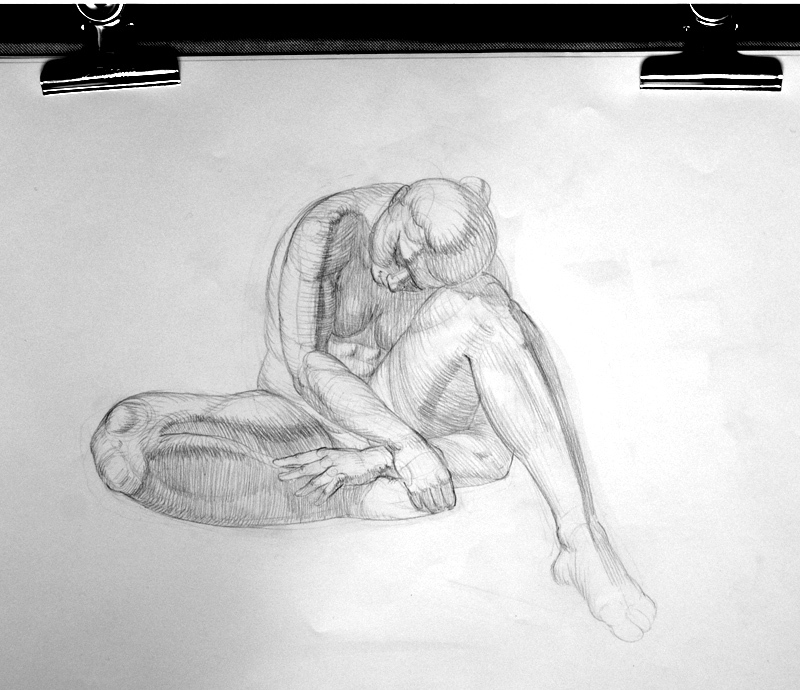 I wanted my shadows to help describe the form, not obscure or flatten the picture, and so I made sure to wrap them around the figure in clear, descriptive shapes. The shadow cast by the arm on the leg was a beautiful opportunity to show the gentle bulge of the thigh, meaning I didn’t need to do much to the lit area, but could keep it fleshy and soft. I tried to remember to vary the breadth of the terminator according to the curvature of the forms, and decided to keep the shadows quite light. This drives everyone mad, because they want to see me darken my shadows for maximum impact. But I potter away at my own little challenges, loving to experiment with how much I can say in a controlled and delicate manner. I did a bad job of this shadow business, I reflected when I got home. 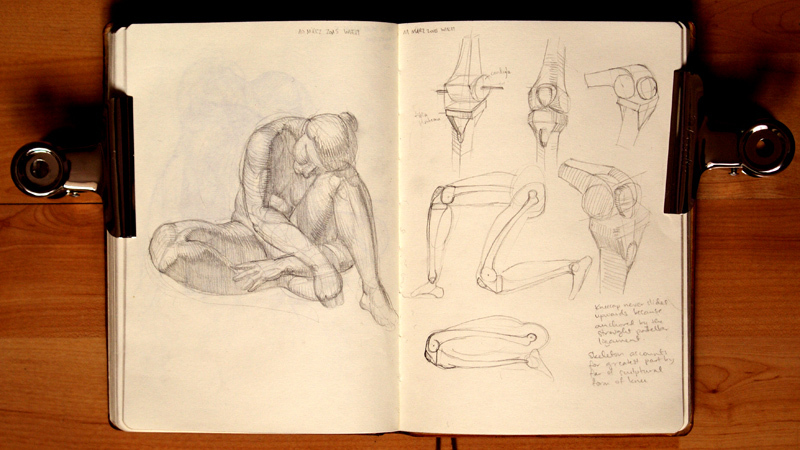 I made another copy in my sketchbook, enjoying the process of redrawing and my growing familiarity with this pose. I marked in the shadows again, and practiced rendering them, trying to keep the tone uniform and trying to do a better job of the terminators—expanding them appropriately, experimenting with how dark they should be. I played around a little with the transition into the light, practicing the strokes I wanted to use. I have been working so hard at hatching neatly and evenly, and I don’t know what the secret is except for probably hatching several million of those tiny lines. I’m never sure that they look any more controlled, but I live in hope that my untiring practice will reward me with superhuman dexterity. I went back on the third evening determined to take charge of those shadows. I forced myself to neaten the tone, making it uniform, and only allowing myself to knock back some subtle reflected light (only according to the form!) with my eraser. Armed with these mantras, I spent some time on the final day trying to match my understanding with what I saw. Then all that remained were the light zones. Having worked out all the forms, the most prominent anatomy, and the direction of rendering, all that was left to do was exercise a controlled hand and make the nicest little lines I possibly could. Bonus exercise! 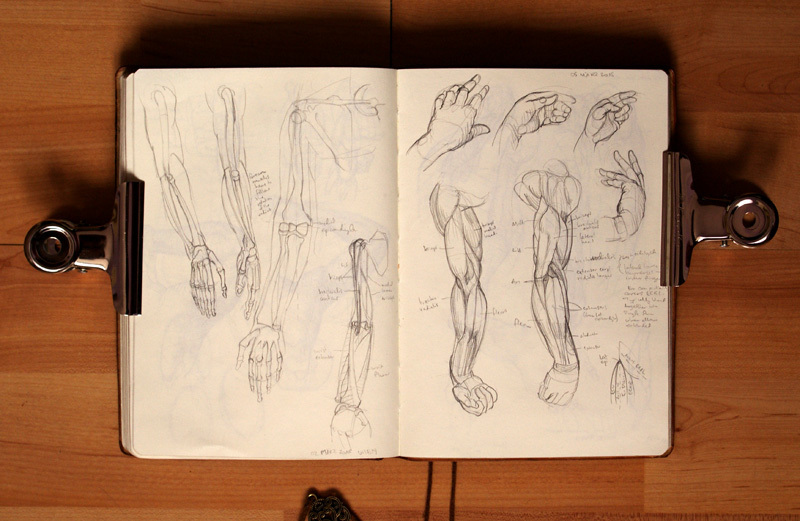 The next evening I put my drawing and sketchbook away, and began with a fresh sheet of paper. I redrew the same drawing entirely from memory (without the hours of refinement!). This part really feels like magic. Have I really internalised all this information? This extra test really consolidates all the new knowledge and all the particular decisions that you have made when working with the model. And you realise what power you have when you understand the human figure, and can summon one at will.